I am stupid. I do not believe in Global Warming. No need to believe in what you know. And I know that globally averaged air temperatures increased for the last 150 years or so. I did the math myself using observations to conclude, that air temperatures around northern Greenland and Ellesmere Island increased 5 times the global average over the last 25 years (Greenland’s Warming, Melting, and Sliding to Sea). So, why am I stupid? 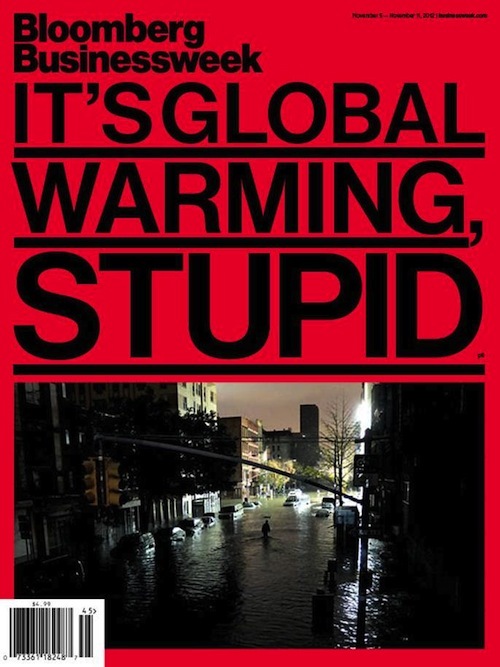 I am stupid, because I totally disagree with what has just hit the news stand about Hurricane Sandy’s impact on the eastern seaboard of North America: It’s Global Warming, Stupid screams this week’s edition of Bloomberg Businessweek with a dramatic cover draped in red. I do not deny that some element of global warming scenarios contributed in some way to this storm, but so did the butterfly I rescued earlier this year from my cat Zoe. The butterfly flapping her wings, I am convinced, contributed to the atmospheric turbulence and thus the weather we got, including Sandy. If this sounds crazy, it is, but so is the headline. We can argue all day, if Global Warming or my Butterfly Effect contributed more significantly to Sandy, but we will not come to a firm scientific conclusion. The Businessweek article has some excellent points on page three with regard to climate change and policies that we can and should make to reduce carbon emissions, but it discredits these well-reasoned policies by using flood waters in Manhattan as the call for action with a screaming headline calling me stupid. If we make policies based on ill-informed drama, political manipulations, and without supporting good empirical evidence, then we do harm. A shallow and short-term political victory does not address the deep and long-term social problems posed by climate change. Solutions to these problems such as carbon-trading, energy efficiency, smart growth, and adaptations are all endangered, if we chose to exploit emotions of the moment. This sets us up for an equally ill-informed and short-sighted political backlash. We ignore science at our own peril. This cuts both ways with regard to the political hackery and partisan politics on the issue of climate change. I can’t stand it, but then, I am stupid. ADDENDUM Nov.-2: An excellent description of the storm’s evolution and relation to climate was published in Science Magazine. Is Climate Change Causing Wild Weather? Are extreme weather events, when considered collectively, evidence that climate change is occurring? If not, what are the missing links scientists still need to study in order to make a more conclusive find? Could these weather events revive congressional efforts to pass comprehensive climate legislation? No, climate does not cause weather, the balances of forces, masses, and energies in the atmosphere do. Furthermore, the atmosphere interacts with oceans, ice sheets, lands, and livings things. Ask an equally ill-posed question “Is climate change contributing to wild weather?” and my answer becomes yes, but with the caveat that butterflies flapping their wings in Tokyo contribute as well. There is more to the question than meets the eye. Globally averaged air temperatures have increased by about 0.6 degrees Celsius per decade over the last 50 years. This warming is not uniform as it varies in both space and time. Some places cool, some places warm, some places cool or warm more than expected. Floods, droughts, mudslides, and calving glaciers always have and always will occur. Some weather events separated in space and time are physically linked via large-scale tele-connections such as Rossby waves in the atmospheric jet stream or the El Nino-Southern Oscillations. So, how much of the currently observed extreme weather events are due to globally increasing air temperatures that also coincide with globally increasing ocean temperatures? Does global warming increase, say, the intensity of hurricane by 1% or 10% or 50%? These much tougher questions are at the forefront of both observational and computational work on environmental physics. The IPCC numerical models and new understanding of key physical processes, I feel, are the only way to attribute global warming effects on extreme weather events. Ice-ocean interactions around Greenland are one such physical process poorly incorporated in IPCC models. Another such process is the way that hurricanes may dominate the ocean heat flux towards Greenland. Just because a pattern of extreme weather events feels like evidence of global warming, it does not make it so. This scientific uncertainty, however, should not distract from the potential costs that a potentially man-made climate change will cause. 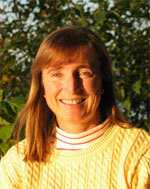 Climate zones may shift, sea level may rise, volatile weather events may become more volatile, etc. All of this may cause additional political instabilities in marginally stable nation states ill-equipped to deal with either natural or man-made disasters.